*** WINNERS *** Louis and Holly are Living the Life of Riley! CONGRATULATIONS! I want to give a big and hearty CONGRATULATIONS to Louis, the winner of the Pillsbury Mini Grands! Biscuits Prize Pack! Louis now has 48 hours to confirm! I also want to give a big and hearty CONGRATULATIONS to Holly, the winner of the TWO 80-Piece Super Sipperz Drinking Straws Construction Sets! Holly now has 48 hours to confirm! 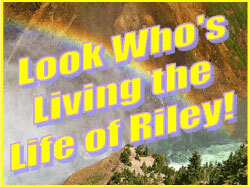 *** WINNERS *** Steph, Tesa and Bethany are Living the Life of Riley! CONGRATULATIONS!